Baroque is the new pop! So goes the motto of bassoonist Burak Özdemir’s ensemble Musica Sequenza. Özdemir’s work is brilliant, but his motto is only half-true: Baroque is also the old pop. And in that way, it’s like Gose beer. In 1965, “A Lover’s Concerto” by the Toys hit the Billboard charts. The song, penned by Sandy Linzer and Denny Randell, uses the famous melody from the Minuet in G Major from Bach’s Notebook for Anna Magdalena Bach. Notable artists including the Supremes and Sarah Vaughan later covered the song, which even appeared in the 1995 film Mr. Holland’s Opus. In subsequent decades, pop musicians have repeatedly drawn from the Bach well. Bobby McFerrin teamed up with Yo-Yo Ma in 1992 to cover the famous Musette from the Anna Magdalena notebook. Eminem sampled Bach’s Toccata and Fugue in D minor on his 2013 track “Brainless.” Of course, Musica Sequenza includes Bach in its avant-garde amalgam of baroque, pop, and electronic music. The list of Bach-inspired pop songs goes on and on, and it is just a small portion of the popular music that bears Baroque influence. Gose (pronounced GO-zuh) is a German ale with geographic ties to Bach. Both the composer and the beer ended up in Leipzig after being born elsewhere. Bach was born in Eisenach and lived in several German cities before arriving in Leipzig in 1723 to assume duties as the cantor of the Thomasschule of the St. Thomas Church. Gose ale originally appeared in Goslar, which sits on the salty Gose river, but it eventually moved 180 kilometers west to Leipzig. There it became so popular that Gosenschänken—taverns dedicated to the beer—appeared throughout the city. Eater tells the “Story of Gose, Germany’s Salty Coriander Beer”. Gose thrived as a regional specialty in the 19th century. But World War II brought German beer production to a halt, and Gose brewing wasn’t revived in post-war East Germany. The style might have gone extinct if a few German brewers had not dedicated themselves to it late in the 20th century. Lothar Goldhahn bought an old Gosenschänke in 1986 and convinced a Berlin brewery to begin brewing Gose for his new pub. In 2000, Andreas Schneider converted an old train station to a Gose brewery. Today, his Bayerischer Bahnhof produces perhaps the best known example of a traditional Leipzig Gose. 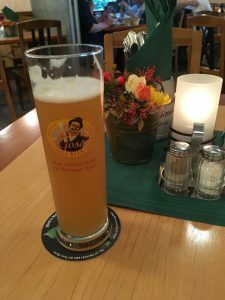 The BachBeer team enjoyed this Gose on a 2017 visit to the Bayerischer Bahnhof. Half of a Gose’s malts are wheat, and half are barley. The brew includes coriander and lactobacillus bacteria. Lactobacillus is also used in yogurt and kombucha, and it gives the beer tartness. The earliest Gose brewers used the saltwater of the Gose river to make their beer. Today’s brewers just add salt. Many American brewers use sweet or tangy fruits to complement the tartness of their Goses. Sierra Nevada adds lime and blue agave nectar to its Otra Vez beer. Anderson Valley offers the watermelon-flavored Briney Melon Gose. And Victory pays linguistic homage to the beer’s geographic roots by using the German word for cherry in the title of its Kirsch Gose. 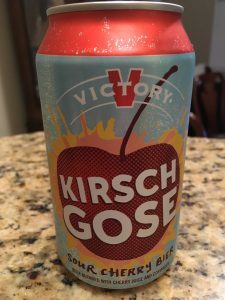 Victory’s Kirsch Gose brings American style to German tradition. Fruity American Goses suggest other links between beer and music. Cynical listeners and drinkers might point to both American Gose and Baroque-inflected pop as signs that modern consumers prefer the saccharine to the traditional. We think the truth is more optimistic. American brewers and pop musicians aren’t adulterating tradition; they’re expanding it. By adding cherry to Gose or electronic drums to Baroque violin, today’s creators are claiming a new space in a long line of artisans. As long as they continue making fresh concoctions from historical flavors, all drinkers and listeners should be grateful.